"Just a line to thank the staff of the Golden Star Star for our most enjoyable trip along the River Thames on Sunday"
"We all had a fantastic night on the Golden Star, I would highly recommend you again." "Thank you to you and the crew for making our family event on the Golden Star a great success"
"Thank you and all your colleagues on board the Golden Star for providing us with an evening to remember." MV Golden Star is possibly the most popular boat of her size on the River Thames. After undergoing a complete internal refit in 2018 she now boasts luxury carpet with a dance floor area to the front of the saloon and complete flexibility in regards to seating arrangements. She is particularly suited to family celebrations, office functions, corporate entertainment, wedding transfers, sightseeing trips and parties for up to 120 guests. See below for more information and pictures, check out our photo gallery, jump straight to her hire rates or get an instant free quote. 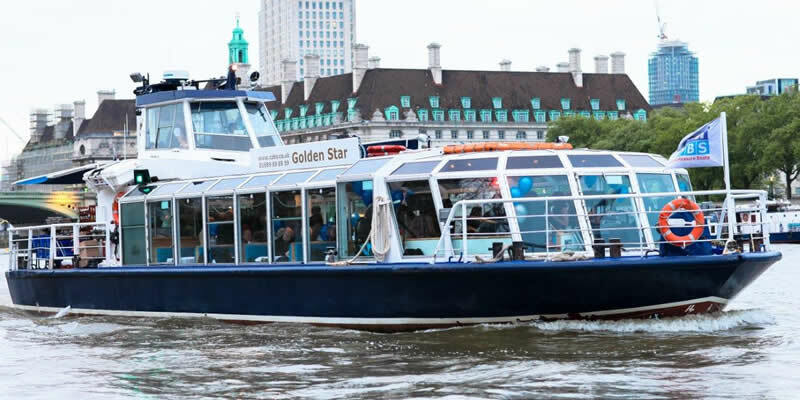 Welcome aboard the Golden Star, one of London's most popular party boats, and ideal for family functions and smaller office or student parties of up to 120. Your guests will enjoy all the comforts of a land based venue, with the added bonus of Golden Star's full height windows allowing excellent sights of London's iconic landmarks. 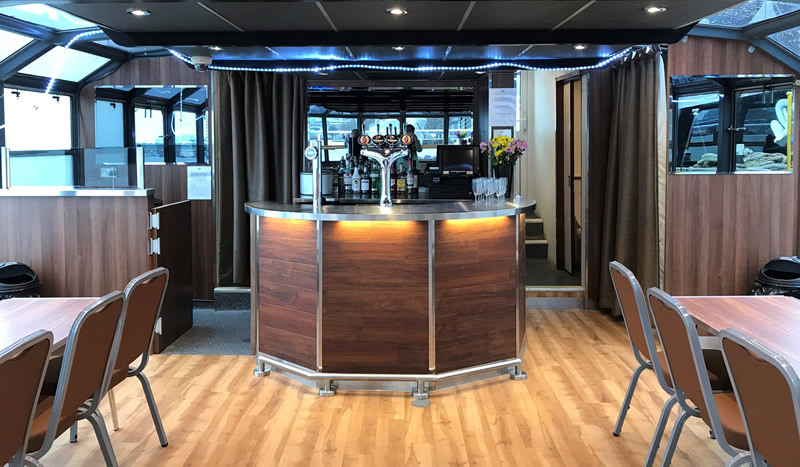 Golden Star was completely refitted internally in 2018 with luxury Amtico flooring for the saloon and the dance floor, sumptuous new seating for guests, and a bespoke stainless-steel bar serving drinks at pub prices. The perimeter of the saloon is fitted with fixed bench seating along each side, with the option of adding tables and chairs to allow for optimum flexibility for your event. If, however, you would prefer to make use of the full floor space for a live band, casino tables or other live entertainment this can be easily accommodated whilst still allowing lots of room to socialise. 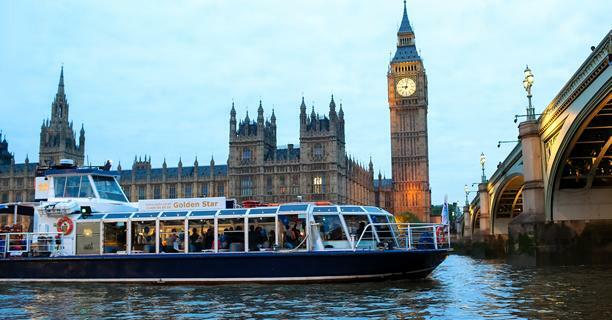 You can also relax at the unique floating bar-top built around the front of the vessel, which offers panoramic views of London through the full-length windows. At the rear of the vessel is a generously sized sun-deck where you can enjoy a glass of Pimms or simply soak up the sunshine. The interiors of all our party boats are non-smoking, however smoking is permitted on the sun-deck of the Golden Star. M.V. 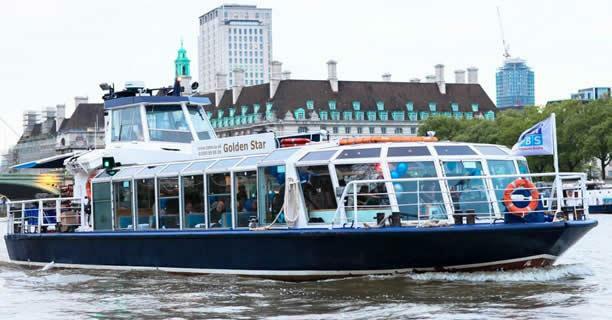 Golden Star is ideal for a wide variety of boat parties of between 40 and 120 passengers, although we are sometimes able to accommodate functions with less than 40 passengers - please follow this link for more information on passenger numbers. 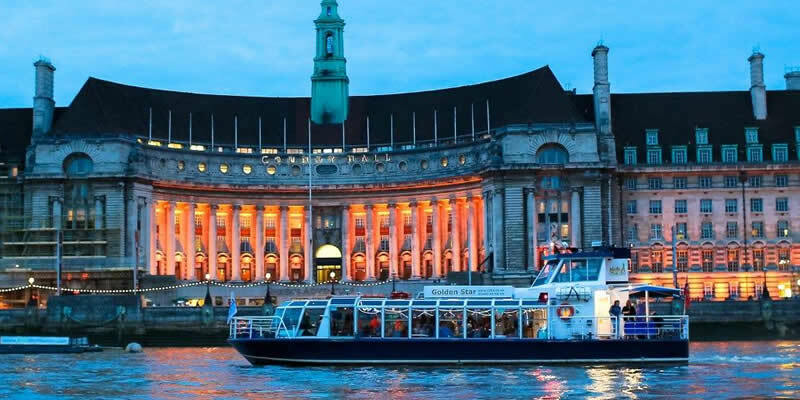 We would advise early booking to avoid disappointment, and would also recommend that you arrange to come down to view the Golden Star as boats on the Thames vary greatly in quality, presentation and layout. We are confident that a visit to any of our vessels will convince you that we offer the best versatility and value for money. Golden Star is able to accommodate up to 120 guests.